Although the leading causes of accidental child deaths include car accidents, drownings, poisonings, fires, falls and gun accidents, there are many hidden dangers that parents are less aware of that can lead to accidents and tragedies. Especially during the spring and summer, lawn mower accidents can be a big problem. In fact, the American Academy of Pediatrics (AAP) estimates that about 17,000 children require care in the emergency room each year because of lawn mower accidents. An 18-month-old in Wichita, Kansas had her leg partially severed below the knee as she played in a backyard with other young children as the operator of her daycare mowed the lawn with a push mower. A 6-year-old in Lancaster, North Carolina was run over as his father mowed the lawn in their front yard, running over his foot and cutting off his pinky toe. A 12-year-old in Atwater, California died while riding on a lawnmower. He was hit by a car. A 4-year-old in Lenexa, Kansas lost his leg below the knee and had surgery to save his arm after his father backed over him on a riding mower. A 4-year-old in Longview, Texas lost a toe and was hospitalized after her mother backed over her on a riding lawn mower. The little girl was playing on the sidewalk while her mother was mowing but then walked towards her mother. A 6-year-old in Kansas City, Missouri who had a rare surgery (rotationplasty) to attach her foot to her thigh, so that it can function as a knee joint and fit into a prosthetic after she was run over by her grandfather's John Deere 345 lawn tractor. A 3-year-old in Abingdon, Virginia who lost his right leg below the knee after he was run over by a lawn mower on Mother's Day. A 2-year-old in Tampa Bay, Florida who had both of her feet cut off at the ankle when her father unintentionally ran her over with a riding lawnmower. A 4-year-old in Texarkana, Texas who lost three fingers and suffered a severe leg injury while trying to jump on a moving lawn mower as his sister was mowing the lawn. A 10-year-old in Fredricksburg, Virginia who lost part of his leg when his foot slipped underneath a running lawn mower. A 4-year-old in Lebanon, Tennessee who sustained serious wounds to his arms and legs after getting run over by a riding lawnmower that was being operated by his 10-year-old sister. A 10-year-old in Benson, Vermont who died when the lawn mower he was using rolled down an embankment and he got trapped underneath. A 9-year-old in Jarrettesville, Maryland who ended up in the ICU after a lawn mower backed over her foot. She was playing in the yard with her younger brother while her father was mowing the lawn and he didn't realize that she was behind him. A 5-year-old in Forest Hill, Maryland who had both feet amputated after her father backed over her on his lawnmower. A 5-year-old in Elizabethtown, Indiana who nearly severed one of his feet when he fell off a riding lawn mower his dad was driving and got run over. A 22-month-old in Charlestown, Rhode Island who lost part of his arm when he reached through an enclosure and his father ran over his arm on his riding lawn mower. A 3-year-old in Millington, Tennessee who was critically injured when he fell off the riding lawn mower his grandfather was driving and his arm went underneath the blades. The boy's grandfather was mowing the lawn with two of his grandson's sitting with him. A 3-year-old in Tabor City, North Carolina who died after getting run over by a lawn mower. He was riding on the lawn mower with his older cousin, who stopped to move a trampoline when the toddler put the mower in gear and got run over. A 7-year-old in Isabella County, Michigan who had his foot severed after he fell off a riding lawn mower he was riding with his dad and his foot got run over. A 3-year-old in Genoa Township, Michigan had her leg amputated after a lawn mower accident in which her grandfather accidentally backed over her while mowing the lawn. An 11-year-old in Washington Township, Ohio needed surgery after her foot was partially severed after a lawn mower accident. A 2-year-old in Lexington, KY died after she fell off the lawn mower she was riding on with her father and 7-year-old brother on a family farm. A 5-year-old who died in Michigan after getting run over by a riding lawn mower. The child was playing in the grass and was run over by one of her parents, who couldn't see her. A 10-year-old in Berrien County, GA who was killed when the mower he was riding on somehow ran him over. His mother found him lying under the machine. A 2-year-old in Revell Downs, MD who lost his right leg below the knee and his left foot after he ran into the path of a lawn mower. These lawn mower incidents highlight how important it is to keep lawn mower safety in mind, especially if you have kids. Unfortunately, lawn mower safety is not something many people think about. 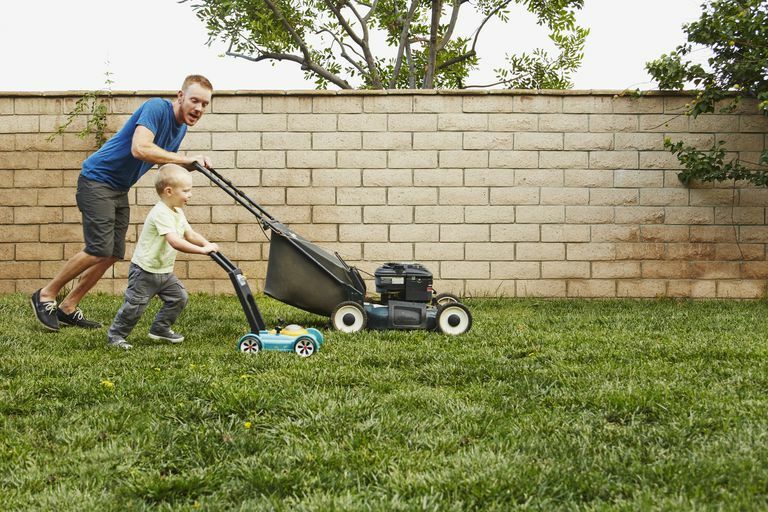 The AAP says that "most children will not be ready to operate a walk-behind power mower or hand mower until at least 12 years of age or a ride-on mower until at least 16 years of age." It is also important to keep young kids inside when you mow the lawn and never let a child ride on your lap while you use a ride-on mower. American Academy of Pediatrics. Steer Children Clear of Lawn Mover Injuries. Consumer Product Safety Commission. Riding Lawnmowers. Document #588.